Whether you are painting your home or need industrial scaffolding painting services, there are several tips to follow. Although we only offer industrial painting services, we do have expertise to share about home painting tips for using scaffolds. Scaffolds are working tools that allows workers to easily reach high areas of the interior and exterior parts of a building during construction works, or while making repairs or painting. There are people who use ladders to do painting in areas of the house high off the ground but working at a height on an extension ladder can be very slow and dangerous compared with scaffolding painting which is safer because scaffolds offers more stability. Using scaffolds for painting also allows the painter to reach a greater area of work by walking across the scaffold floor surface which is wider. In fact, a scaffold that comes with wheels and rollers offers more flexibility to the painter when painting. However, if it is not setup or used properly, scaffolding can also be unsafe but when assembled and used according to experts’ instructions, scaffolding are safer, better and quicker alternative for working at a height when compared with extension ladders. If your building has an elevated area that must be painted, you can hang or suspend the scaffolding against the wall with support beams. Scaffoldings come in three main categories. It is either it is the suspended, supported or the aerial type of scaffold. Whatever the category, scaffolding suitable for painting consists of a floor surface with support provided by a framework of horizontal and vertical metal poles. The vertical beams may rest on wheels or base plates on the ground floor. The whole structure creates an elevated solid platform suitable for working at a height. There are scaffolds that are suspended when assembled by using a brace attached to the side of the building with little or no support directly connected to the ground. Some suspended scaffolds are held in place by cables hooked either to a crane or the top portion of the building. Scaffoldings are suitable for use both for interior and exterior painting works and there are some that can be modified for different uses. For example, if you want to paint ceilings or walls that are not at great heights but can’t be reached easily while standing on the floor and you aren’t skilful at using long painting poles, portable scaffolds can be used. For small scale painting and other home improvement projects, some companies have portable hanging scaffolds that can be used. For large scale projects where great heights and many workers are involved, some companies have scaffolds that are more elaborate with brace and rigging system to provide support for many painters working at the same time in addition to beams that are heavier. To determine the amount of scaffolding you need for your painting project, measure the platform height you want and specify the maximum height for your project before you attempt to rent one. The useful tip here is that the working height you need would normally be 5 to 6 feet above the platform. So, measure the height from the floor and subtract five to six feet from that height. That is the maximum height for the scaffolding you need to work with and that is maximum height you should specify if you want to rent a scaffold. Irrespective of the type of tools for scaffolding painting, they are generally made of aluminium which makes them lightweight and enables shifting from one position to another possible. Scaffolds are solid, stable and easy to use when assembled properly. Scaffolds are usually assembled for use and dissembled once project is completed. Therefore, it is important that you follow instructions properly whether you are assembling or using the scaffold for painting to guarantee safety. 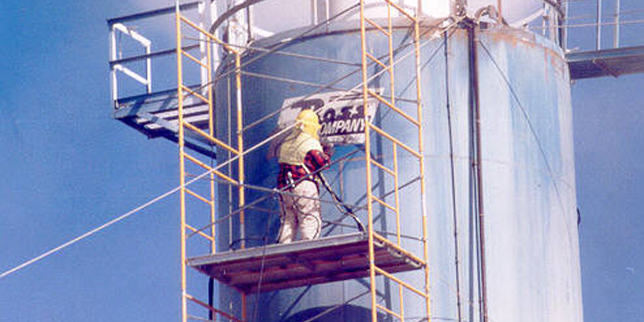 Setup the scaffold following manufacturer’s instruction and inspect the structure for any loose bolts. Where the structure sits matters, therefore, ensure it is on a level and solid ground possibly swept with a broom prior erecting up the structure. Where you will be working at a great height, ensure you tie the scaffolding with tie-in devices or heavy wire. Properly fix any loose bolts and test the assembled scaffold for stability. Avoid using any bent frame or braces for the setup. Secure the top of the structure with guard rails to prevent falling. When you are sure you have a solid scaffold assembled, go up the structure and carry all the equipment you will need for the scaffolding painting on the flat walking board. Do the painting work one section at a time and then move the scaffold to reach other parts that needs painting. Since safety should first be your concern, never neglect to keep to safety rules contained in the manual for the painter’s scaffold. The Occupational Safety and Health Administration (OSHA) regulate the construction and use of scaffoldings. The OSHA rules for using scaffolds do not allow scaffolds to be placed on other type of grounds other than solid and stable surface. Never assemble scaffolds on loose grounds, loose bricks or stacked concrete blocks; doing that will be in violation of the OSHA safety codes. If you have legal questions about contractors see P.J. Yttrup & Associates Pty. Ltd. for more.